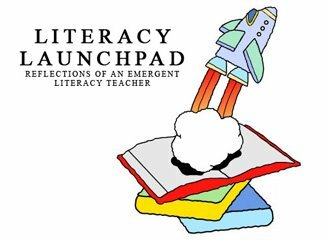 In February Literacy Launchpad did an author study on Mo Willems. 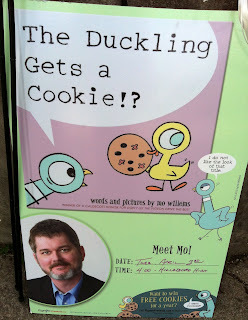 So how serendipitous that my local independent bookseller, Parnassus Books, was hosting an event with him today in promotion of his new book The Duckling Gets A Cookie!?. Did you know today was the book's official release date? Or as Mo refers to it, "The first day you can legally read it!" I only found out about the event last night, and spent this morning emailing the parents of my students in hopes that some of them might be able to make it to the event as well. At lunch, my kiddos (and one of their friends) made some Mo-inspired art (Literacy Launchpad projects from February) to bestow upon the author when we met him. 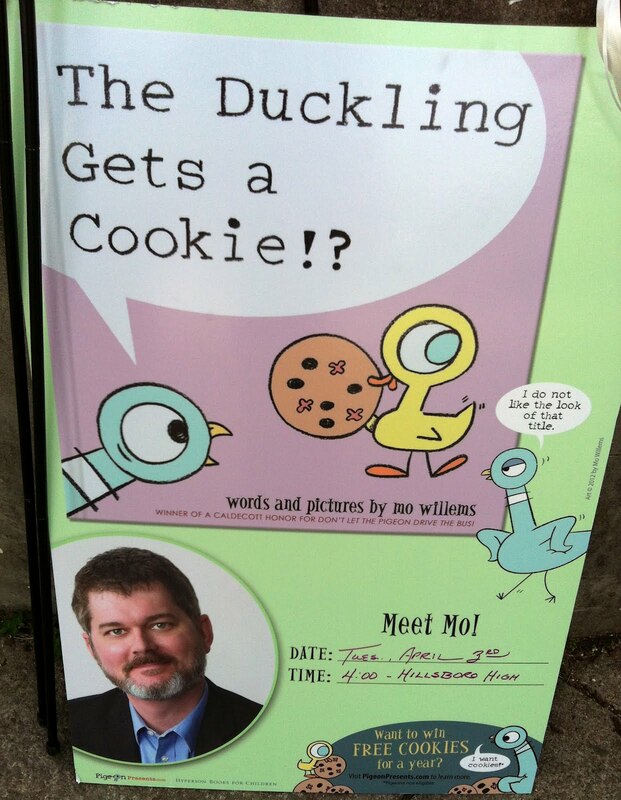 We made it to the event on time, bought a copy of The Duckling Gets A Cookie!? to get signed, and even got pretty good seats. Mo came out and wanted to get the photo-taking out of the way so we could all spend our time "experiencing the event, instead of documenting it." Love that! So he did a bunch of goofy poses for us all. Us moms got our photos. The kids got some giggles. He even did a booty-shot pose for us (Which I missed with my camera, darn!). Mo was very funny and extremely entertaining. He read us Listen to My Trumpet, which he explained is an "easy reader," but a "hard writer." And he of course also read us The Duckling Gets A Cookie!?. Both books were big hits with the crowd. Every night when Mo's family sits down together for dinner, they put a big sheet of paper down the middle of the table and they all draw during the meal. "Elephant Gerald" came into being as a dinner doodle originally. "Piggie" followed shortly after. Mo used to be a writer for Sesame Street. Do you know what "Elmo" means in Spanish? It means "the Mo!" TeeHee! Mo gets all his ideas from Belize, because they have to be "belizable." Mo's newest book is excellent! Laugh out loud funny (but I'm sure it helped that Mo was reading it to us). I'm really glad that all three of my kids were able to be there for the event. My older ones were talking with their friend that had come along, after we got home, and I overheard them saying that they thought the event was going to be "babyish", but that it was actually "really good!" Check out this trailer for The Duckling Gets A Cookie! ?